The two zodiac signs of Gemini and Taurus love compatibility have to take the time to learn about each other in a romantic relationship. Both Gemini and Taurus couple have a lot to learn from each other and a lot to give each other. However, these two zodiac signs are going to have to adapt to each other and put some work into their relationship. Gemini is the twins. This will help to explain why they are indecisive. They will also sometimes seem like two people at once. Their symbol of the twins helps to explain this nature. The bull will have to try to not be clingy. At the same time, the bull will have to find a way to give one twin the protection and closeness they want in the relationship. The Taurean will have to find a way to give the other twin the independence they need. If they are able to do this, the twins and the bull can have a successful relationship. Over time, Gemini can be reliable and stable. They have a cheerful, philosophical approach to life. Taurus will need to have a little patience. They have a different approach and are calm and rational. Because of this, the twins and the bull might have issues with their relationship. Gemini might think Taurus is boring. Taurus might think Gemini is restless and insubstantial. They can certainly learn from each other though. The bull can learn to be more invested in life. The twins can learn to have change, joy and enthusiasm in their life in this Gemini and Taurus compatibility. The best thing about a Gemini Taurus relationship between these two zodiac signs is that they can give each other a lot of protection in the relationship. The bull will have to be ready to accept the protection the twins can give them. If Gemini and Taurus soul mates are sure to keep a consistent communication with each other, they can have a happy, steady relationship. Gemini is a Mutable sign. Taurus is a Fixed sign. Gemini man or woman will move easily from one person or situation to another. Taurus is more likely to concentrate on one project or person at a time. The bull is going to have to give the twins the freedom and enough personal space they need. The twins will be willing to teach the bull that sometimes being flexible is more important and productive than being Fixed. However, the bull has to be willing to learn this lesson. Even though they are very different, the Gemini and Taurus love compatibility can have a relationship that works very well. The twins are smart and attentive and can cheer up the bull. The bull can find the twins’ liveliness and witty nature very appealing. The twins will be able to get something from the bull. The Taurean can show the twins how valuable it is to take a step back and slow down. The Gemini and Taurus in bed might not have much of a physical or sexual connection. The twins will be willing to romance the bull, but it will be more of a stepping stone than something the twins believe in. They will want to move fast. Because of this, Taurus will spot lip service when they see it. They are not going to be able to keep the relationship going at a slow burn. If the Gemini Taurus compatibility in this relationship is to work, they are going to have to have some patience. The planet Mercury will rule over Gemini which is important for communication, while the planet Venus will rule over Taurus which is important for love. Both Mercury and Venus are close to the sun, meaning they will always be in the same area. These two planets are very different though. Physical enjoyment, seduction, and affection are important for Venus. Male and female energies are both part of Mercury. Because of this, Gemini can use either energy at any time. Gemini will just use which one is most beneficial at the time. The bull wants a partner who is reliable and seductive. The twins are incredibly intellectual but the bull might not care about this zodiac trait so much. Because of this, Gemini might feel under-appreciated. The twins often feel their clever wit is their most admirable trait. At the same time, the twins will realize they need to be the intelligent and seductive partner the bull wants. Gemini is an Air sign. Taurus is an Earth sign. The twins will decide based on their philosophical nature and somewhat on a whim. The bull might be more rational. Taurus will feel the need to analyze how their decisions will further their goals. Gemini can be indecisive and will sometimes make a split second decision. At the same time, the twins will not necessarily feel that they have to stick to their decision. This is why they can be indecisive at times. The bull can be clingy, which can cause issues in the Gemini Taurus marriage. At the same time, if the twins are uninterested and distant, this can cause the relationship to have other issues. Both in this Gemini Taurus compatibility will have to be accepting and flexible to make the relationship successful. The twins will not be predictable. The bull will have to see that even if the twins are flirty, they are not trying to cheat and their relationship is very meaningful to them. The bull might be too stubborn at times. However, the twins are more flexible and can use that flexibility to be compromise with the bull. 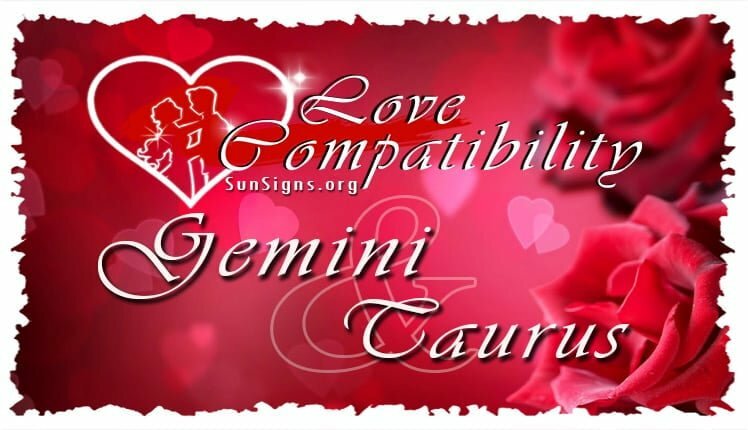 Gemini and Taurus compatibility might not have a lot of similarities. Taurus is stable and likes to consider all aspects of their decisions. They are not quick to act on anything and can concentrate on their goals for as long as they have to in order to achieve it. At the same time, Gemini will follow their intellectual whims. The twins can be impulsive. They varied interests and passions and can easily jump from one to the next. In a romantic relationship, the bull will absolutely require that their partner is committed. At the same time, the twins need their own personal space. The bull is happiest with a steady routine. The twins will enjoy changing things up and having variety. In a Gemini Taurus friendship, they can have an easy relationship. However, these two zodiac signs might have more issues if they are in a romantic relationship. Gemini is an air sign, which means they tend to go through life making decisions based on their whims. They might make their partner feel anxious. The twins might get tired of having to reassure their partner. Taurus is an earth sign and more reliable. They will want a partner they can depend on as easily as their partner can depend on them. The bull might feel they are waiting for the other shoe to drop, though they might not necessarily be able to say why. They will have their work cut out for them in this relationship. However, a relationship between these two zodiac signs can be very worth it. The Gemini and Taurus in love will have to be able to communicate with each other to have a successful relationship. Gemini is ruled by the planet Mercury. Mercury is the planet of communication and because of this it is likely that Gemini will do a lot of the work in the relationship. The twins will spend a lot of time reassuring the bull that they should not take any flirting Gemini might do as anything serious. If the Gemini dating the Taurus can understand each other, their relationship will be easier. However, if they can’t then Taurus is likely to be clingy. Because of this, Gemini will feel they are being restricted. If they feel restricted, they are more likely to pull away and be distant which can hurt the bull’s feelings. The bull in love needs stability. The twins in love need independence and carefree play. Because of this, Gemini Taurus love compatibility might find it hard to make their personalities mix.